The picture with this blog shows the effect of a sparkling chandelier in our dining room. Cleaned this gold plated, crystal chandelier is stunning. • Clean door mats: I started the major cleaning with the door mat and the front porch. I cannot say enough about what a difference it makes to rid the entry of all the fine grainy construction dust/dirt which the kitchen remodel workers brought with them. • Clean/shampoo the carpets, draperies & upholstered furniture: Craig and I removed the draperies from the dining room and took them to the cleaners. As we removed the hooks, I marked the drapery hook holes with a permanent marker. Tomorrow when we get them back it will be easier to put the hooks back and hang them. I called the company I use to clean our blinds. He came last week; took down the kitchen shades; cleaned them; and returned them in pristine condition. This week he will come for all the other shades. • Clean light fixtures: The kitchen has all new light fixtures. 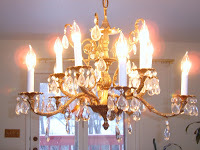 In the dining room I used the best ever product (Sparkle Plenty) to clean the crystal chandelier. All it took was putting down plastic and newspapers, spraying the chandelier, letting it dry. Voila! Instant sparkle…beautiful! • Clean refrigerator’s condenser coil: I’ve done this in past years. This year the refrigerator is new and wonderfully energy efficient. I’ll do the coil cleaning in about 6 months. • Wash all bedding, comforters, mattress pads, and pillows. Vacuum and flip your mattress over to provide even wear. Clean out from under your bed. Replace bed with clean bedding. This is now complete in two of the three suites. The final suite will be done this week. Camai Bed and Breakfast’s deep cleaning is just beginning. By early May when the bed and breakfast has its biennial inspection for continued membership in Anchorage Alaska Bed and Breakfast Association, everything will be ready. This entry was posted in Uncategorized and tagged spring cleaning tips by admin. Bookmark the permalink.